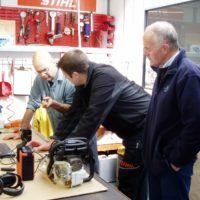 Home » News » Latest News » Why is now the Perfect Time for Mower Servicing? Why is now the Perfect Time for Mower Servicing? At this time of year, your lawn mower will probably be tucked away in your garage or garden shed so while it is not being used, you can make sure it receives some care and attention so it will be on top form when it is needed once again. When spring finally arrives, you are sure to be busy in your garden so it is important to make sure that your lawn mower is ready for the tasks ahead of it. The last thing you want is to roll your lawn mower out of your shed or garage only to discover that it is not working properly. A simple and pleasant task of mowing the lawn on a sunny spring day could easily turn into a nightmare if you discover there is a problem with your lawn mower that needs fixing before you can start working on your garden again, so service it now to ensure this isn’t the case. Having your lawn mower checked now means any problems that may have arisen can be highlighted before you need to use it again. As we all know, a small problem when caught early can be quick and cheap to fix however, if the problem is left, it may easily become worse over time and leave you with a large bill further down the line. We offer professional lawn mower servicing to ensure your mower is fully functional and ready for when spring arrives. Our experts are vastly experienced and will be able to provide you with machinery maintenance and services such as grinding and sharpening and hydraulic pipe making alongside a convenient collection and delivery service. Get in touch today to arrange for our team to service your lawn mower this winter.